Rawlins Paints stock a high performing range of stain blocking paints and primers for use on interior and exterior surfaces. 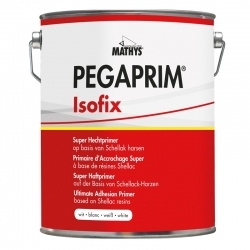 These specialist and durable problem solving coatings are designed to hold stubborn stains back that would normally continue to bleed through normal paints, including nicotine stains, smoke damage, water staining, etc. Many people think that just by applying multiple coats of the paint you're using or using a solvent based paint can hold stains back but it's simply not the case. We offer stain blocking paints that have been tried and tested for over 30 years, most of them even help adhere to difficult surfaces and dry quickly so you can overcoat them in a few hours. Don't take a chance, use a professional product and make sure you don't have to do the project again. 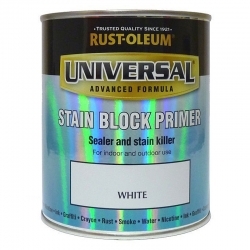 Simply using standard paints to block stubborn stains will not suffice - so, if you are unsure as to which stain blocking paint or primer is best to use in your specific situation, call Rawlins Paints' technical support team and we will talk through product solutions and recommendations with you. When the anti-smoking laws were introduced for public, commercial and industrial properties - including cafeterias and communal spaces - ingrained nicotine stains on walls, ceilings and unit surfaces became a problem to paint over. The same applies for public houses, whose walls and ceilings had had constant exposure to cigarette smoke damage for decades. Even now, years later, these troublesome and stubborn stains can still be seen coming through countless coatings of basic emulsion paint. This is due to generic wall and ceiling paints not being suitable for this 'specialist' and demanding task. Stain blocking paints can prime and top coat a surface, covering, sealing and getting rid of nicotine stains - leaving a fresh, clean and 'as good as new' finish. Throw open the windows this summer and once and for all get rid of ugly and browning nicotine stains. Zinsser Cover Stain is designed for interior and exterior use, and can be used on walls as a white primer prior to overcoating with a coloured topcoat. 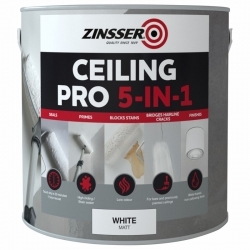 Zinsser Ceiling Pro 5 in 1 seals water and smoke stains on ceilings, prolonging the life and white colouring of the surface without legacy stains recurring. For nicotine stained wallpaper, Zinsser Wallpaper Cover-Up is the ideal primer, sealer and stain-block in one to deliver a fresh, smooth matt off-white finish. Of course, this paint can be used any time to paint over wallpaper! Cafeterias, restaurants and food manufacturing plants are prone to greasy stains that are difficult to paint over. From deep fat fryers, grills, steamers, and even pizza ovens, the steam and condensation that stains surrounding walls can contain bacteria, which as well as cosmetically looking horrible, could be problematic when applying for and being assessed for a health and hygiene, or food preparation certificate. Those greasy stains, after preparation can easily be painted over with an appropriate stain blocking paint that is also easy to clean or paint over with a specifically coloured top-coat. Along with improving the adhesion properties of many surfaces, including those previously painted with a gloss finish, or aluminium, stainless steel, ceramic tiles, glass or vinyl, Zinsser Bulls Eye 1-2-3 Plus can quickly mask and treat historical stain problems, like stubborn oil spots, rust, marker pens and graffiti. Available in a small range of pastel colours, it is suitable for interior and exterior use without it being a bold colour protruding through a new topcoat colour – it is advised to pick a colour as close to that of the topcoat as possible, though. Stain blocking primers can be used on internal and external surfaces, walls and ceilings, to stop the spread of grease, grime and dirt from continued exposure to a source - such as an oven, sink, bath, food, tea and coffee preparation areas, inks or smoke. Where there has previously been fire damage, the correct stain blocking primer can cover blackened, exposed and unsightly surfaces to allow for a white, light and bright top-coat again. Hallways, changing rooms, passageways and areas where light vehicular equipment has scuffed the walls can also be quickly remedied with a stain blocking paint covering the black scuff marks that otherwise come through when painted over with standard emulsions. Zinsser’s B-I-N has the capacity to cover, contain and treat smoke damage on panelling, wood trim, old wallcoverings and wallpaper, glossy paints, and clear finishes. This coating is a very versatile solution for many stains which can cause unhygienic or unapologetic odours. If you are looking to transform an old and well used fireplace in a public house, for example, B-I-N can bring its dated and dirty look up to date with a stylish, clean and welcoming finish for patrons and guests in this ‘online service review’ era. Water damaged ceilings are one of the most noticeable and hard to ignore areas of stain damage. From leaking baths, roofs or bad plumbing, the browning yellow stain is one of the unsightliest stains in domestic environments. 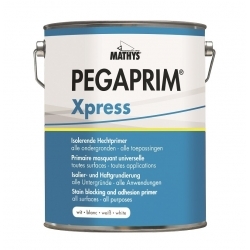 Many landlords face this problem with ex-tenants, but rather than wallpapering or painting over the stains with several coatings - apply a primer like Mathys Pegaprim Isofix, or all-in-one stain blocking paint to cover the stain, often in one coat. Of course, the source of the leak must be fixed first, and once that is done, a stain blocking paint can allow the damp area to breathe and dry-out, whilst covering it and sealing the damp from spreading any further, darkening or smelling worse.